A key but thus far unheralded component in what makes a stay at Zed's Place so rewarding is Bajan Bob. Here is pictured with Denzil, a young lad who often stays here. Bajan Bob lives under the stairs outside and is partial to leftovers from KFC bargain buckets. He professes disillusionment with the contemporary pro surfing scene but, in truth, never really got his act together for contests. As he says: "I was never in the right frame of mind come the big day. I could be distracted by anything - the drop of a hat, a Colonel's Combo, a roti from Chefette, a stray cliche, anything. Worse, leashes always made me feel at once excited - as if I were about to go on a walk - and imprisoned, as if I were a mere canine. It was a tough dilemma to resolve and, if I'm totally honest, I usually ended up barking up the wrong tree." Bajan Bob is 12, and gives me the following advice for tomorrow's trip to the Soup Bowl: "There's a Chefette on the way, up near Six Roads. Can you stop and bring me back some chicken nuggets?" The way he wags his tail is irresistible, and I can't refuse his humble request. Likewise, I find myself unable to bail from my Soup Bowl debut, despite a recurrence of my groin strain and any number of other credible excuses. More tomorrow, and hopefully - if I'm still capable of engaging in financial transactions at fast-food joints after the Soup - some nuggets for Bob. Today's morning surf did not happen owing to a pronounced need for rest. This was the result of an excellent evening out at Cafe Luna with Karen, Zed Layson and his fiancee Claudia. If anyone reading this is ever as blessed as we have been to be able to visit Barbados, a meal at Cafe Luna is a must. It'll cost more than eating at Oistins but the cooking by the chef, Canadian longboarder Moo, is worth every Bajan dollar. Zed and I had the beef tenderloin, the girls had the sushi - and speaking for Karen and myself, we felt the food was the best we'd ever had. I exaggerate not - just writing this makes me want to head over there for more. The wine was also superb, and it flowed liberally. Perhaps a little too liberally, for this morning I couldn't have laid flat on a surfboard let alone jump to my feet and catch any waves. However, this afternoon Harry and I, with a local lad called Brandon, had a fun surf at small Freights. My longboard conversion continues though Zed and Moo are talking of a trip to the Soup Bowl tomorrow. I don't fancy this on a longboard and given that it's likely to be onshore and gnarly I'm not sure I fancy it all that much, full stop. We shall see. Meanwhile, Barry Gale, the Bajan lawyer I interviewed yesterday, alerts me to Chris Welch's website. Check it out for some great shots of Bajan surfing (and skating), as well as last week's north swell. And check this footage also - a slice of Bajan reggae by Barry's son, who when not studying at Bristol University goes by the name of Vizion and makes some very cool music. Today I'm 42. I'm at Zed's Place in Barbados. I've surfed my brains out for the past 10 days and there's still a fun wave to be had at Freights. We might venture to the Soup Bowl this weekend and tonight we're certainly out at Cafe Luna. It's all a bit too good to be true and I find myself touching wood on a daily basis. The events of Wrecking Machine happened eight or nine years ago but they sometimes pop into my mind and, when they do, my ability to be a master of disaster feels all too proximate. During my Wrecking Machine phase, I was a lawyer (that's two plugs of your first book. I'll let you off because it's your birthday. Ed.). This was a profession whose intellectual aspects always intrigued me but whose rigmarole wasn't my thing. At all. Today I'm off to interview a lawyer I met in the line-up at Freights yesterday, this for a weekly slot on lawyers with interests outside the law (which today features sometime contributor to this blog and Perranporth surfboat rower Andy Cox). The Bajan lawyer's name is Barry Gale and watching him surf yesterday put me in mind of Tim Kevan's book, 'Why Lawyers Should Surf'. Kevan's book is a passionate call for professionals to destress themselves by gliding on a few turquoise walls. 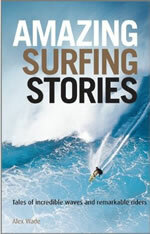 Kevan, with co-author Michelle Tempest, makes more than a few nods to the Romantic notion of the sublime, a trait that he shares with many writers on surfing (though to my knowledge, Kevan is the first writer to co-opt TS Eliot - arch-modernist and poet of despair - in favour of surfing). While avowedly a motivational book Why Lawyers Should Surf contains many fascinating curios on surfing and makes me wonder whether, if I'd been surfing as much as I'd wanted to do during my legal (illegal) days, I might have avoided the Wrecking Machine phase. Pondering why lawyers should surf is not a question Barry Gale will have trouble answering. He carved and trimmed elegantly at Freights yesterday and looks very much like a man who's found the answers. Or, maybe, like someone who didn't need to ask the questions. Meanwhile, isn't it fantastic to see Kelly Slater notch up his second successive win on this year's WCT? Slater claimed his 36th career win and his third victory at Bell's Beach. He's 36, which, in pro surfing as in many sports, is generally regarded as past it. Great stuff. By way of proving that the internet knows no barriers, here in Barbados I'm contacted by Deza Seventeen, a Portuguese company specialising in surf-themed art and design. They have a nice line in some of the funkiest mugs and teapots around, as well as a variety of personalised artwork. Henrique, please send me some images and I'll post them. Meanwhile, Freights continues to deliver. But I fear that I'm in danger of alienating a large number of my readers if I keep banging on about surfing perfect waves in boardshorts, so will say no more other than to note that tonight I'm having a drink with Moo, the surfer I mentioned the other day. Moo, the owner and chef at Cafe Luna, does not look like a man who holds back. A late-night game of poker has been suggested and the Bajan idyll of being first in the water each day and then surfing for three hours might well be suffering from a severe hangover by the time this post appears. Perhaps the The Aqualads will help ease the pain. Again, I'm told from afar of their allegedly dulcet tones - does anyone know what they're like? Here in Barbados I hooked up with the man who might just be crowned Britain's first world surfing champion by mid-October. I'm talking about Ben Skinner, the Jersey-born Perranporth resident who was here with Russell Winter, Ben Baird and Kirstin Prisk for last week's serious north swell. At 23, Skindog has already achieved a huge amount in national and international surfing. He is the reigning British Longboard Union champion and won a silver medal at the 2006 World Surfing Games. He bagged another longboard triumph when he won the European Professional Longboard title, but is also an excellent shortboarder as he proved at last year's Gold Rush contest at Fistral. He surfs big waves, too - having both tow-surfed and paddled (on a longboard) into Aileens. A large degree of additional cool comes from the fact that he shreds on a skateboard as well. For the second time, this year will see a WCT for longboarding - and Skindog might be the man to take the title. "If I get in the right frame of mind, I think I can do it," he says, with poise and equanimity beyond his years. A hint at the competitive streak necessary for success at this level comes when he adds that "I'm not travelling to the events to come second. I'm after first place each time I paddle out." Further confirmation of Skinner's drive comes when he confesses that last year, when he was eliminated from the longboard WCT at Les Cavaliers, he punched a sign in frustration. "I'd had an interference called against me and was gutted to go out." This burst of anger resulted in a broken hand, but I met a much more chilled Skindog in Barbados. It was his first time here, and he loves the place. "It's been a brilliant trip," he says. "I was so lucky to come over with Russ. He knows the island like the back of his hand and we surfed some sick breaks. Ben is so powerful to watch and seeing Russ surf is an inspiration. He's easily the best surfer Britain has ever produced." Skinner's chances of eclipsing Winter come down, initially at least, to his father, who took him surfing at the age of three. "I can't really remember when I started surfing but I think it was then," he says. "My dream was always to be a pro surfer and I've been in the water all my life." A key moment in his surfing development then followed when he was eight: "I met Joel Tudor, who was my hero as a kid. He took me surfing and I saw what you could do as a longboarder." As soon as he left school, Skinner threw himself into as many surfing contests as he could. "It's taken a while to start achieving my potential but I proved to the world what I can do at the Surfing Games," he says. In Barbados, Winter's local knowledge meant that the trio surfed a break called Ignorance. "It's a right-hander over a slab that just reels," he says, eyes lighting up at the memory. "We had it to ourselves at a solid 4ft. It's one of the best waves I've ever surfed. We also caught the Soup Bowl reasonably clean as well as Duppies and some smaller waves on the south coast. This island has got some awesome surf." Skinner, whose main sponsors are Oxbow and Reef, mentions Adam Griffiths and James Parry as two of the best longboarders in the UK, and pours yet more of his considerable energy into Newquay-based Adams Surfboards (more on which when I'm back in Cornwall). With partner Michelle England he's a new father, to nine week-old Lukas, whom he couldn't wait to see upon his return to the UK. In Ben Skinner, the UK could have a future surfing world champion, while surfing generally has one of its most accomplished all-round performers. Look out for his progress, and, hopefully, no broken bones, at the first WCT longboard event on 5 May at Les Cavalliers in France. Images courtesy of Kirstin Prisk and Surf Station. We've settled into a nice routine here in Barbados. In the mornings, Harry and I go and surf Freights. During the day, as a family we hang out at Surfers' Point or head off on mini-tours of the island. At about 4.00pm, Harry and I go back and surf Freights until it's dark. Usually we then head out en masse again and eat at Surfer's Bay, a very cool establishment which has been showing Surf's Up a fair bit lately. I mention this film, of surf-happy penguins, by way of a confession: I find myself worryingly gripped by the action scenes (though I can't help but ask - why are said scenes almost always on left-handers?). Yesterday Karen and I deviated from the norm a little in venturing, sans enfants, to the Atlantis Hotel & Restaurant, at Tent Bay, for lunch. The Atlantis dates from 1884 and overlooks the rocky coastline and endless blue horizon just along from the Soup Bowl (messy and a little over head high yesterday, with its vertical take-off taking out two surfers in just the five minutes that we were there). At the Atlantis we were welcomed by Theo Williams and, outside on the terrace where the wind turns from something that messes up surf to a pleasingly cooling part of life in Barbados, we enjoyed Bajan cooking at its finest. The Atlantis is used as a retreat by Bajan writer George Lamming, and no wonder. It's a great place and I'd recommend it to anyone, whether they're here to surf or otherwise. Now it's time for Freights. Great to hear from Jeffrey Dijkhoff in Aruba. Those who've followed this blog for a while might recall that Jeffrey and his wife Shaendeeh saved me from poker hell when I was on their island about 18 months ago. As these pictures show, Aruba caught the same north swell that hit Barbados last week. Thanks for getting in touch, Jeffrey - as ever, I hope to return to Aruba one day. I'm just back from surfing Freights with Harry. The swell had increased and we spent a couple of hours out in head high surf. There weren't too many rights to speak of but the lefts were fantastic, and at this size, we got a real taste of how the break gets its name. The freight train lefts were irresistible but left us with a mammoth paddle back to the peak. I had a couple of waves that were the best I've ever had on my backhand, but (and please, if you like, factor in paternal bias) Harry surfed superbly throughout the session. He looked really smooth and fluent and I was stoked to see him surf so well. Another grom looking good was Jack, the son of a surfer by the name of Moo whom I met last night. Moo is a larger than life Canadian who fell in love with surfing in Barbados and moved here, with his wife Sarah, eight years ago. Moo runs the top-rated Cafe Luna restaurant and was paddling out with Jack at Freights - their local break (how good is that?) - just as Harry and I came in. We watched from the grassy bank overlooking Freights as Jack worked a shortboard nicely on the perfect peeling lefts. As I write this Matthew Hurst, the surfer from Stoke whom I've mentioned in the past couple of days, will be arriving home with his girlfriend Rachel. This is a man who was totally stoked by his experience here at Zed's Place - not least because as a goofy-footer, Freights was right up his street - and who might also be the UK's most dedicated surfer. As UK readers will know, Stoke is not exactly renowned for its surf. In fact, it's just about the most land-locked city in the UK. But Matthew regularly drives the minimum of two and a half hours to surf at east coast breaks around Scarborough, at Hell's Mouth in Wales or down to the Gower Peninsula. He first rode a board at my local break (not looking great today) seven years ago and hasn't looked back since. Matthew surfs well and if anyone is living proof of the fact that determination and keeping a weather eye on the swell charts can still give you the stoke from surfing, it's him. Respect. Here are a few shots of what Russell Winter, Ben Baird and Ben Skinner scored yesterday. They're courtesy of Kirstin Prisk and you'll be able to see much more in Carve soon. The group shot is of the Soup Bowl in the morning but from the lines drawn by Russell Winter it looks like it cleaned up nicely in the afternoon. Meanwhile Freights was bang on the money for Harry and I again this morning. We surfed for two and a half hours and had the place to ourselves (along with local lad Brandon and Matthew from Stoke) for the first 90 minutes. We weren't quite styling like Mr Skinner here but I had some very nice trim from a Surftech Donald Takayama noserider (yes, the longboard conversion continues - don't tell Stef Harkon!). We'll be back for more this afternoon. Until then, vaya con dios. The future is Freights - but it didn't seem that way at first light. Surfer's Point was blown out and the word was that the west coast swell had died. It struck me that the strong onshore wind would render the Soup Bowl, well, a foaming, frothing, soupy mess, and once there that's exactly how it looked. Remarkably, however, all of Russell Winter, Ben Baird and Ben Skinner didn't see much wrong with it - certainly nothing that the tide wouldn't fix later in the day. As ever, the gulf between what the pros will surf and what average Joes like me are happy to paddle out into was all too clear. In the car with me was one of the UK's best surfing photographers, Kirstin Prisk. We followed Russ and the two Bens to Maycocks, which - to me - was perfect at around chest to shoulder high, and then to Duppies, which also looked very appetizing at a little overhead. The crew opted to surf Duppies but alas, I had no board. I watched with Kirstin - shooting this trip for a forthcoming issue of Carve - as Skindog styled on his longboard, Russell Winter cast beautiful fans of spray with just about every frontside off the top and Ben Baird showed that he's as powerful in the water as he looks on land. It was great to see, and shooting the breeze with Kirstin was a pleasure (of our conversation, more in the near future). But watching endless right-handers breaking in a tropical paradise without a board was tough, so after a while I hit the road back to Surfer's Point, vowing to check a series of west coast spots en route and drive all the way back, with board, if there was even a hint of a wave. Everywhere was flat but once back at Zed's Place I bumped into one of the British guys staying here, Matthew from Stoke. He was stoked from Stoke because he'd just returned, with a number of other surfers staying at Surfer's Point, from surfing nearby perfect Freights. Harry and I made it there within half an hour and paddled out into chest high crystal-green perfection. The setting was breathtaking and the supply of easy, fun lefts and rights endless. We both had a series of great rides and know exactly what we'll be doing first thing tomorrow morning. With thanks to Vacation in Barbados for the image.